Allow users to log in and sign up with their Steam account, an option available under our Social Login integrations. To use Steam Login, you must have a Steam account with at least one paid game purchased recently. The Steam provider is disabled by default and needs to be activated before use. To do this, go to Settings -> Users -> Social Login and click the "Activate" link on the Steam provider box. A provider can be defined for each brand, the "Enabled" option should be toggled to on for it to be available to users on the frontend. 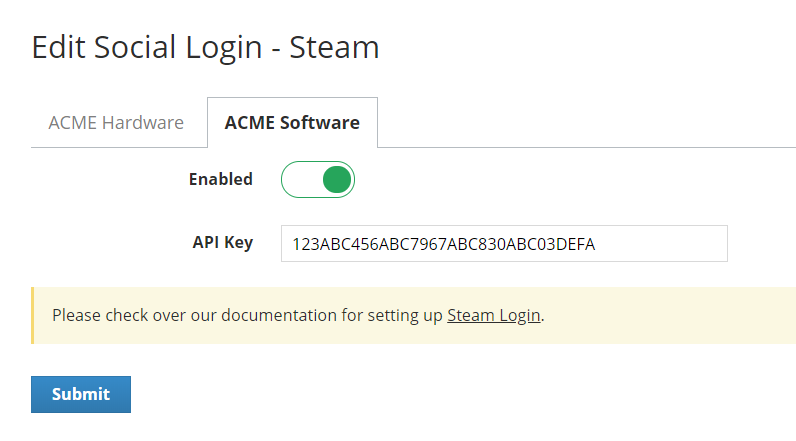 To set up Steam login, you will need a Steam Web API key, follow the steps below. Visit https://steamcommunity.com/dev/apikey and login to your Steam account. Enter the help desk domain when requested and click "Register". Enter the key given in to the SupportPal configuration screen and click "Submit" to save. If you get an "Access Denied" message when trying to request a Steam Web API key, you will need to purchase a paid game.